Crashes involving motorcycles are so frequent, in fact, the average rider is five times more likely to suffer an injury than someone in a car. The resulting medical bills can rapidly overtake an individual’s or family’s ability to pay, even with insurance. Add to this the lost wages from weeks or months of being unable to work, and the financial stress can become overwhelming. Attorney David Azizi knows that worrying about money is the last thing you need when you’re already dealing with physical and emotional trauma. If you or someone you care about has been injured in a Los Angeles-area motorcycle accident, or if a loved one has died as a result, call his law offices 24/7 at 800-991-5292 as soon as possible. Based on the specific details of the accident, he can quickly determine whether you likely have a case for seeking monetary compensation from a liable party. The initial consultation is free, and if you hire him, you don’t pay anything until you’ve won your case. Angelenos have chosen David as their lawyer since 1998 for several reasons. First, he has extensive knowledge and expertise, built up over many years, of motorcycle accident cases. Second, he is experienced in not only advocating for accident survivors, but also for families who are grieving the death of a loved one. And third, with his 98 percent success rate, he has a reputation as a strong and effective advocate for those he represents. In other words, you are not a statistic or number to David but a real person that he will fight for! Every one of these causes could be grounds for a lawsuit against another party, whether it’s another vehicle operator, a local jurisdiction (like a city or county) or a company (that manufactured a faulty motorcycle part). The best way of determining if you have a case or not is to consult with David and to take advantage of the expertise he offers. He knows, as you also might if you’re an experienced rider, that the most common crash scenarios for a motorcycle accident involve the inability of a car or truck driver to see the motorcyclist. And the single most common situation in which these crashes occur is when the driver is attempting to make a left turn while the motorcycle is approaching the intersection. The diagrams below illustrate one example of this. 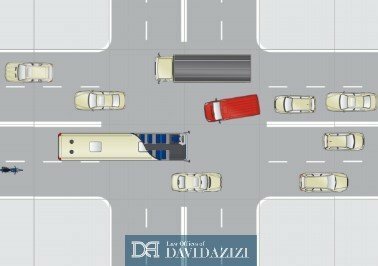 In Diagram 1, we see a red cargo van preparing to make a legal unprotected left turn. Simultaneously, a blue motorcycle (at the bottom left) is moving in the opposite direction. The driver of the van can’t see the motorcycle because a bus is obscuring his view. At the same time, the driver of the van feels pressure to turn quickly because there are several cars behind him also waiting to turn left. 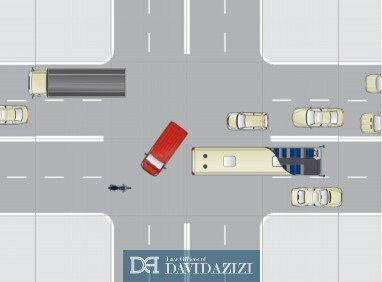 In Diagram 2 below, we see the driver of the red van turning just as soon as the bus has passed him – and either colliding or nearly colliding with the motorcycle. Not only are motorcycles more difficult for drivers to see due to their smaller size, but sometimes low light conditions, glare from the sun, and the presence of rain also make them less visible to other vehicle operators. It should be noted that even if you were speeding or had alcohol in your system when an accident occurred, someone else may still be at fault, or the fault may be shared between the two of you. In cases where the responsibility is found by a court to be shared between you and someone else, the compensation you receive will be lower than if the accident were entirely the fault of the other party. Regardless, discuss your incident with David, and he’ll be able to determine whether a case can be made for you to pursue a liability claim. Please know that time is of the essence in these cases. It’s vital to contact David right away if you’ve been involved in a crash. Evidence can disappear quickly, particularly during the rainy season. Especially crucial are tire skid marks; these marks help to determine the actual speed at which each vehicle was traveling. It’s also critical to be able to interview witnesses while their memories are still fresh. 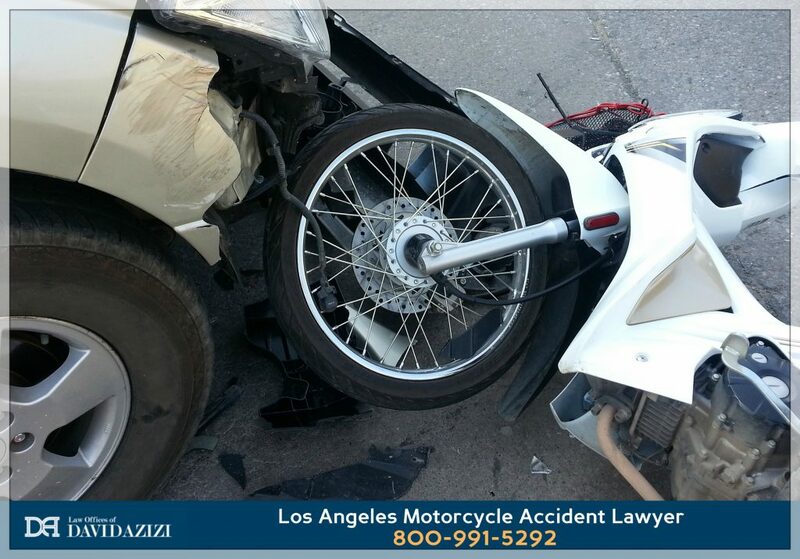 A second reason people across Los Angeles have turned to David Azizi after motorcycle accidents is his experience helping families. He has filed a number of wrongful death lawsuits over the years, winning significant financial compensation for families who have lost loved ones in accidents. Every case is unique and may not resolve in settlements as high as those he has previously won, yet he is always committed to aggressively pursuing compensation for bereaved families from liable parties. David’s intense commitment to families comes from a genuine concern for them. As a married father of three young children, David most definitely can sympathize with those who have lost someone they care about. He knows that tremendous shock and grief follow a fatal crash and that additional stresses then accompany the expensive process of funeral and burial planning. And if that weren’t enough, grieving families have to deal with the loss of income from their family member’s passing. David understands that monetary compensation doesn’t ease a family’s pain and grief. But if you hire him as your lawyer, he will do everything he can to help you obtain a settlement that will cover the many costs, expenses and lost wages involved after a deadly motorcycle crash. 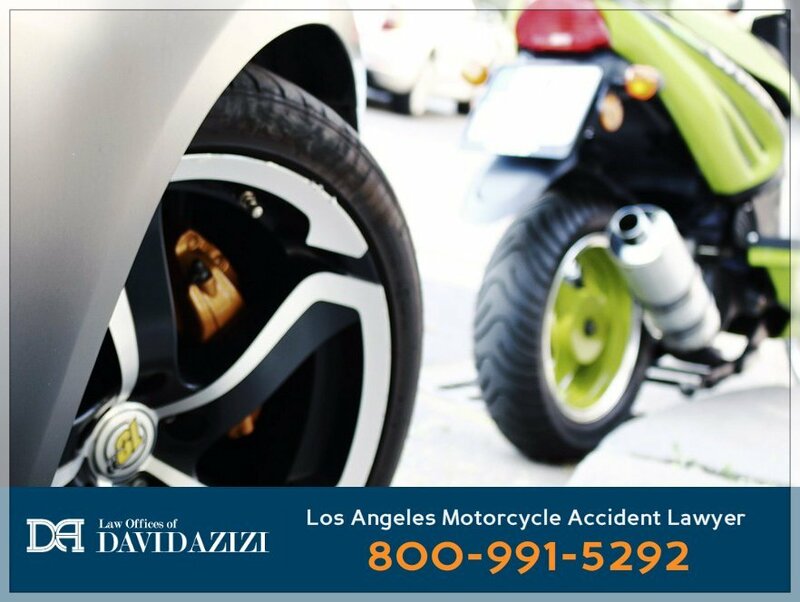 A third major reason why L.A.-area survivors of motorcycle crashes choose David Azizi is his high level of effectiveness. He has a 98-percent success rate at winning compensation for his clients, and that has given him a reputation, even among the companies that he takes to court, of being an advocate who gets the job done. If you’re a motorcyclist recuperating from your injuries, or if you're dealing with the aftermath of a beloved rider’s death, David will represent you through the legal process of filing suit against a negligent party. He knows you’re already using every bit of energy to heal; he will explain each step and even prepare you for things that the opposing side may say in court. And because he always wants to be accessible, he will give you his cellphone number so you can ask questions as they arise. Before the lawsuit is filed, he does his homework, as they say. He and his team investigate every detail of the accident and the circumstances that led up to it. He goes over every line of the medical injury reports. He hires experts to accurately reconstruct the accident, demonstrating the fault of the negligent party. David also works with you to help you calculate your losses. These include but aren’t limited to the costs of necessary medical treatment, long hospital stays, and weeks or months of physical therapy. If you’ve lost a loved one, it does include the funeral-related expenses as well. He then helps you to project the wages that will be lost due to injury or death, as well as the likely ongoing costs of future medical care. This can include mental health treatment as you cope with your severe injuries or with the traumatic, sudden loss of your loved one. He knows it can feel intimidating to take legal action, especially if it is against an insurance company, a manufacturing corporation, or a city or county. That's why you can choose David with great confidence, as many already have since the 1990s. He’s effective, experienced and second to none in his knowledge and expertise as a motorcycle accident attorney. Call 800-991-5292 right away for your free consultation, any time of day and any day of the week! David and his team look forward to hearing from you.